Patrice Moncell is turning heads, packing houses and earning accolades in Jackson night clubs. If her golden voice or rainbow-dyed hair don't grab you, this rhythm & blues singer's name should send up a red flag. Mississippi's own Moncell prodigiously was named after Broadway and Metropolitan Opera superstar Patrice Munsel. 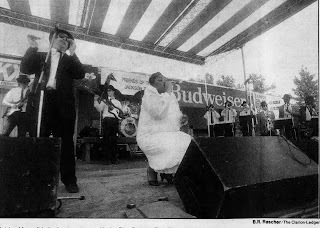 Moncell too dreamed of becoming an op-era singer, but the freedom offered on an R&B stage won her over. "I enjoy the energy in a club — feeding off the people there, their energy," Mon-cell, 27, said. "When I get onstage, I'm a free spirit. "I guess I've become addicted to it," the Meridian native said. 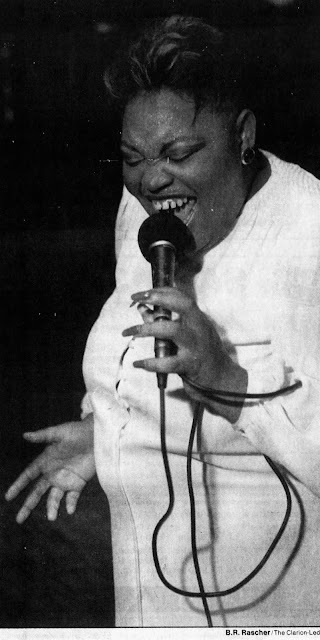 "Patrice seduces the audience is what she does — with high energy, lots of ener-gy," said Rose Anderson, owner of Casa-nova's night club in Jackson. "She packs the house here, full houses. The crowd? It's wild. "She's the hottest thing in the South." Anderson — the new co-host of Black Gold, a dance music show on Jackson's WLBT-Channel 3 -- added, 'Patrice can sing anything — blues, R&B, anything anybody else sings. I haven't seen anything like it." For nearly nine years, Moncell has sung in such Jackson night clubs as Soop's, Sundancer, Subway Jazz Gallery, The Dock, The Place, Scrooge's and Simply Raw. She also has opened concerts for Gladys Knight and The Spinners. For nearly four years, she has had her own band, The Company. Nowadays, Moncell performs Wednesday nights at Casanova's and Thursday nights at Name of the Game. She occasionally appears at Jesse Robinson's Place and at Hal & Mal's, all in Jackson. "She radiates," said Hal & Mal's co-owner Malcolm White. "Patrice comes onstage and the audience immediately attaches itself to her. "She has great stage presence and versatility . . . marvelous range." This summer, the local music industry took notice. Moncell swept up two top awards —Female Vocalist of the Year and Local Entertainer of the Year — at the 1990 Jackson Music Awards. "I was totally shocked. I had no speech planned," Moncell recalled. didn't think I would get anything. "I was stunned at both awards." When in doubt, Moncell sings. For one impromptu acceptance speech, she leaned into the microphone and belted What's Goin' On to a cheering audience. Based on crowd reaction, Moncell was the runaway hit soloist of the night. 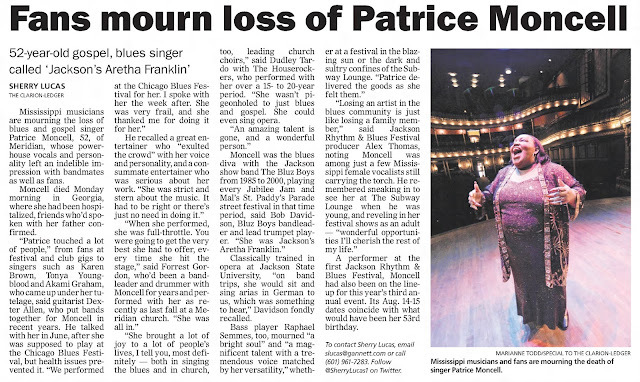 Born Patrice Moncell Gathright, she graduated from Meridian High School in 1980. 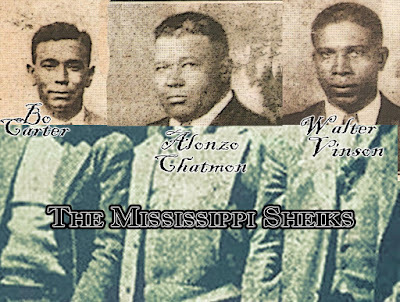 She attended Meridian Junior College, where she was the first black female in The Variations. She earned a lead vocal spot in the contemporary pop group. In 1982, Moncell moved on to Jackson State University to major in music with an emphasis in operatic vocals. She became ill in 1983 and had to quit school. 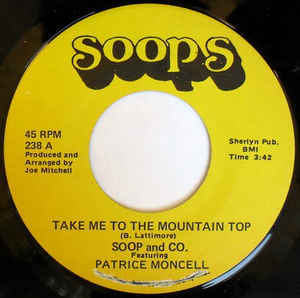 Patrice Moncell became her stage name in 1983 when, Gathright mistakenly was omitted on the credits of her first and only single record, Take Me to the Mountaintop, on the Soop's label. The song remains in her club act. She recorded an album, but it never was released. Since college, Moncell has made a living as a songbird. "I've been very blessed," she said. She has penned "15 or 20" songs, but has performed only two. She is saving the others for her future. Her biggest onstage ally is "spontaneity." "I'm liable to do anything on-stage, except strip," she said of injecting comedy into her act. "I'll say anything. I try to make them laugh. "I step a little out of bounds, then 1 like to come back inside. I'm not into vulgarity," she noted. "I step out just enough to leave it tasteful." Her hairdo is part of the live surprise. "My hair has been 100 different colors. It's a way of expressing my-self," she said. "That's one thing women come to see me for. And men like it; they think I'm a big freak. "As a matter of fact, yesterday I got up, looked in the mirror and thought, I don't like it anymore. So I shaved the sides and back off, not the top. I color the top a lot." Moncell mixes her own dyes for the desired special effects. "My hair has been blue, forest green, orange, flaming red, platinum, fuchsia and cinnamon," she said. Now it's sun-shine yellow and brown. But I want it pink, hot pink." This all sets the stage for her life’s theme: music. "My friends tell me to 'shut up' sometimes because, even when I'm not performing, I'm singing all the time," she said. "That's my hobby. That's my everything." Since childhood, Moncell has idolized world opera legend Leontyne Price of Laurel. That prediction came true. But all of Moncell's dreams have not. "I want to be a major recording artist," she said of pursuing an R&B career. "I want to sing and I want everybody to share it with me…I know that sounds really silly, 'but that's the way I feel. "And I still want to sing with the Met." Clarion Ledger, July 14, 2015.